These industry changes prompted the ISU to publish a revised strategic plan last year, acknowledging that while LOFs still had an important function, the days when over a hundred or more such contracts might be signed were probably over. Instead, the ISU is keen to promote the wealth of expertise and experience its members can bring to salvage operations, particularly with regard to pollution prevention. The emphasis on economising, Herbert stressed, had the potential to one day come at the cost of some kind of major disaster. ISU members, however, could provide a “gold standard of high-quality engineer solutions”, ranging from the relatively basic clean-up of crude oil from a beach to thermal imaging of a shipwreck on the seabed that may be leaking bunker fuel. For the past 25 years, the ISU has conducted an annual Pollution Prevention Survey of its members, in which salvors return information on services they’ve conducted over the previous 12 months and the quantities of potential pollutants (cargo and bunker fuel) involved in the operations. More recently, the scope of the survey, which originally focused on oil cargoes, has been expanded to include other pollutants such as containers. “Containers often contain pollutants and if they go overboard they also become a danger to navigation, so with the growth in the container trade it seemed sensible to record them,” said Herbert. The statistics for the latest survey, conducted in 2018, appear to support this decision. While the number of incidents concerning vessels carrying crude and refined oil products was up to 1,302,988tonnes from 933,198tonnes in 2017, such fluctuations can often be attributed to one or two extra incidents across the year. 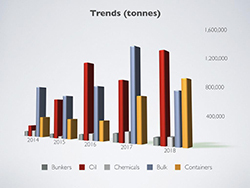 However, the sharp rise in containers involved in salvage cases, measuring 59,874TEU from 45,655TEU a year earlier, is indicative of a growing trend reflected by the increasing number of container ship fires.